Data breaches at major organisations have become a weekly event, but don't always make it into the public eye for months, or even years, after they happen. This is both because it can take some time for an organisation to become aware it has been breached and because few organisations are forthcoming about security concerns. This lack of willingness to communicate breaches can be because many fear a loss of respect or trust if they admit a breach has occurred, and in certain cases companies may even be liable for fines or damages in a class action. Of course, not declaring breaches can also come with a sting in the tail. Individuals might find some of their other accounts become compromised, or experience monetary or identity theft - in extreme cases people can find themselves in debt, their property sold, or even be gaoled. Governments in Australia have been slow to put measures in place to protect citizens in these circumstances - even forcing citizens to take them to court to rectify these situations, as a Canberra homeowner recently had to do. Unfortunately in Australia it's not even mandatory for data breaches to be reported, so there's limited information about how widespread the threat or cost actually is, making the situation even harder to deal with. I subscribe to a service (Have I Been Pawned?) that alerts me when a service I use is reported as hacked - but even this is largely limited to international online services and it remains very slow to discover when these hacks occurred. 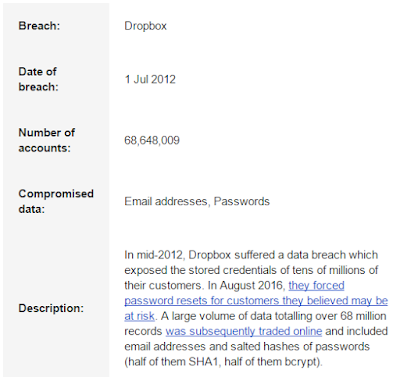 The example below shows how Dropbox has only in the last few weeks acknowledged a hack in 2012 which exposed the details of over 60 million people - that's more than twice Australia's population. Their information (including mine) has been traded online by the hackers. Now some people might consider this a normal part of living and doing business in the internet age - but should we? There's a number of steps that both governments and commercial organisations can take to reduce the impact of these types of breaches and help ensure they occur far more rarely. The first step is a mandatory requirement to publicly notify everyone who may be affected by a breach within a week of it being detected, with a mandatory public announcement of the breach within two weeks. If the notification is made on a timely basis, organisations should not face a significant fine from the government, but if notification is late, they should face a fine equivalent to a significant portion of their gross income for the previous year. Where organisations are breached, they should be legally required to, at their own cost, identify the cause and rectify it, putting in place appropriate security measures to prevent recurrence and fix any other identified security issues with their system. Organisations should also be put on a three-year watch list, where if they suffer another breach and cannot demonstrate that they maintained their security infrastructure to a sufficient standard, are subject to that very significant fine detailed above. This should apply across both private and public organisations - with government agencies held to the same high standard of conduct. In fact it could be argued that government should be held to an even higher standard due to being required to maintain public trust and how certain agencies may compel information from individuals and store it for their lifetime. Governments should also set up positive security regimes, where people are rewarded for identifying and reporting security holes in government properties. Corporations could also be provided with incentives to do the same, such as subsidising rewarding and rectifying appropriate security issues in a similar way to R&D subsidies. The government needs to work with governments around the world to ensure that laws punishing identity theft - fraud - are sufficiently strong to create a strong disincentive for anyone who might be caught either perpetrating a hack or benefiting from it. There's already a base in place for this, but there's ways to strengthen it and treat identity theft with the degree of severity it requires. Finally governments need to ensure they are appropriately educating citizens through a variety of channels - providing educational content, ensuring that no government agency allows users to create weak passwords, training their own staff (essential for national security), training police forces to understand and engage appropriately with citizens who report identity theft and rewarding companies who educate their staff and customers for reducing the overall risk. Now it is important to be realistic about the situation. Australians use a variety of foreign online services and it is impossible to secure them all, all of the time. Hackers will find ways in via mistakes in ICT configurations, slow maintenance, zero day exploits and social engineering. However the incident and severity of the data breach risk can be greatly reduced if Australian governments stop turning a blind eye to the issue and begin seriously engaging with it. At minimum governments need to broaden their cyber security policies to recognise that it's not just the government itself at risk. From here, there's many opportunities, such as those described above, for governments to be more proactive about protecting their citizens from the risk of data breaches, from enemies both domestic and foreign.